I’ve been catching up on blogs lately & reading a few books, the technical type, as one might imagine. To collect my thoughts I decided to have a sit down and write up a little bit on each of the entries & books I’ve found notable. Here’s the recap. Bobby Johnson warns us to Not Anger Uncle Bob! I can haz clean codez plz. Bobby continues on telling about his recent Journeyman Visit to Getty Images. Bobby is doing these visits in the spirit of Corey Haines Journeyman Tours. I’ve got a ton of respect for anyone that can coordinate time & effort to do this. The amount of learning, open mindedness, and other characteristics are high on my list of awesome. Cheers to your visit to Getty Bobby, it was good reading about your experience. 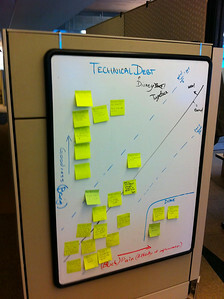 I must say, one of my favorite bits is the picture you got of the technical debt kanban. Absolutely great idea! Anyway that is all I’ve got for now. Will probably do another wrap up sometime later in the week. Until then, cheers! This entry was posted in Reviews on December 21, 2010 by Adron.